The only place that Milwaukee stumbles is in fastening torque and we're stills scratching our heads about that one. But no matter how many times we repeated the test, the fastening torque was in the same range. Aside from that, it keeps the pace with Makita and Ridgid, sporting the most compact footprint and best feature set. When we first used Ridgid’s Stealth Force Pulse Driver, I wondered why no one else had brought an oil impact driver to the market. Its quiet operation paired with faster driving was game-changing to the point of earning a 2016 Pro Tool Innovation Award. Makita followed suit with a smaller, less powerful model and Ryobi’s Quiet Strike came next. Now the Milwaukee M18 Fuel Surge enters the fray and we have several questions. We need to understand where it fits as far as noise level, driving power, and compact design. We were one of the first to get our hands on the new Hydraulic Driver, so let’s dig in! The only place that Milwaukee stumbles is in fastening torque and we’re stills scratching our heads about that one. But no matter how many times we repeated the test, the fastening torque was in the same range. Aside from that, it keeps the pace with Makita and Ridgid, sporting the most compact footprint and best feature set. * Results as of February 11, 2019. Check out the latest updates on our Best Hydraulic Impact Driver page as new models are released. What makes a hydraulic driver different from an impact driver is the presence of a hydraulic drive system. As the hammer strikes in an impact driver, each blow creates a forceful punch that drives the bit around. The hydraulic drive in this driver uses oil expansion and contraction to spin the collet. This is less violent and creates a push that stays engaged longer than the hammer on an impact driver. On your end, you feel a strong, less violent impact that is usually at a lower rate than traditional impacts. The Surge, however, impacts at a faster rate that should result in very fast driving. Torque is one of the more misleading numbers when it comes to impact tools and especially now that drivers like the Milwaukee M18 Fuel Surge are emerging. Let’s try to make some sense of it. Essentially, a drill delivers constant force by pushing the chuck until it binds up or the clutch engages. An impact driver hammer spins freely, building up momentum until the brief moment it engages the anvil with as much force as it can muster. The hydraulic drive in the Milwaukee M18 Fuel Surge engages longer (and less violently) than an impact driver, but still has some free spin time on the oil contraction sides before engaging the next push. Because each driver engages the chuck differently, 1000 inch pounds of torque will net you different results in each type. The Surge comes in with 450 inch pounds of torque – not necessarily impressive on paper, but let’s wait and see how it drives before making any conclusions. The Milwaukee M18 Fuel Surge was designed to be compact and lightweight – more like Makita’s Oil Impulse Driver than Ridgid’s Stealth Force. If you’ve seen the Makita model, you might be surprised to find that Milwaukee made the Surge even more compact. They’re almost identical in height, but the Surge has a shorter head at 4-7/8 inches. Weight comes in at 2.32 pounds bare on our scale. With the compact battery installed, it’s 3.24 pounds. That keeps it much lighter than the Stealth Force’s 3.04-pound bare weight, but a bit heavier than Makita’s 1.92 pounds. The Milwaukee M18 Fuel Surge has four driving modes including a self-tapping screw mode that are cycled just above the battery. From Mode 1 to Mode 3, you’ll get 900, 2100, and a lightning fast 3000 RPM. The impact rate tops out at 4000 IPM. Both top speed and impact rate are higher than a standard impact driver. Milwaukee’s standard handle, rubber overmold, and trigger are present – ergonomically solid and easy to handle. With a compact battery, the driver is really well-balanced for horizontal, overhead, and downward applications. When driving down, the balance point is just below the trigger. A single LED light is activated by the trigger and placed just below the collet. I’m personally a fan of the tri-beam LED that surrounds the head to eliminate all shadows on the Stealth Force, but this is an upgrade over lights mounted above the battery. A reversible belt clip is included as you’d expect and your forward/reverse/lock switch is in the traditional easy to operate position behind the trigger. Milwaukee is claiming the Surge has up to 50% reduced noise levels, 3 times less vibration, and drives faster than standard impact drivers. That’s easy enough to test – and we certainly did! When it comes to noise, there’s no doubt the Milwaukee M18 Fuel Surge is quieter than a standard impact driver. To my ears, it sounded quieter than all three other oil impacts, particularly at the lowest speeds. I still have some testing to do with the sound meter to prove it, but initial numbers back that up. At high speed, the Surge definitely drives quickly. You’ll notice it once you get past how quiet it is compared to your standard impact driver. As for driving faster than a standard impact driver – it’s pretty close. The Surge performed our screwdriving test featured in our 18V Impact Driver Shootout (25 three-inch screws into stacked OSB) right around the middle of the pack. I only had time to run it through once, so I’ll give you a more solid indication once I’ve spent a little more time with it. It’s also capable of running smaller lag screws. Again, I have only had time to gather some first impressions so far, but we’ll run it through the same number of tests as we sent the others in our shootout and update you. Vibration reduction comes around comes around thanks to the oil. You get the softer push of a hydraulic drive design that clearly translates less vibration to your hand than a hammer striking an anvil. While I don’t have a meter to test the exact amount of vibration produced, it’s greatly reduced compared to any of our impact drivers. 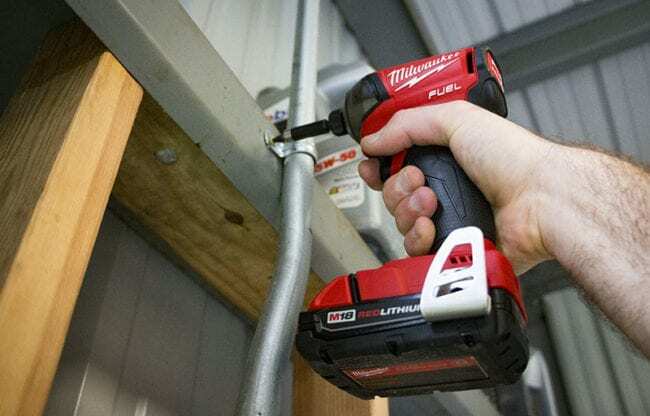 The Milwaukee M18 Fuel Surge has moved into the oil impact driver sector with a very capable screwdriver for both wood and metal applications. You’ll want to turn to an impact wrench for the heavy-duty stuff. So where does the Surge fit in your toolbox? I think we’re seeing a slight divergence in paths when it comes to screwdriving. Some manufacturers have placed a 1/4 inch collet on their drill as a dedicated power screwdriver. On the other side of the coin are these oil impact drivers that accomplish a wider range of tasks with greater speed and settling into a middle ground when it comes to noise level. For many Pros, the Surge is going to replace the impact driver since it’s capable of doing 90% of what your impact driver already does. Where the impact driver struggles to complete the heavy applications, the move is simply to an impact wrench. Milwaukee’s already backing up this thinking by offering their M18 Fuel Hammer Drill in a kit with the Surge instead of an impact driver. At $149 for the bare tool with the compact size, light weight, and solid performance, this is about as close to a no-brainer as you get for Milwaukee users. If you’ve already got a cordless impact wrench in your arsenal, it would be easy to give up your traditional impact driver for the Surge. This review originally posted on October 10, 2016. It has been updated to reflect its performance in our impact driver shootout. “For many Pros, the Surge is going to replace the impact driver since it’s capable of doing 90% of what your impact driver already does.” Even my wife found this statement funny. While I admit this tool is interesting saying it can only do 90% of what your current tool does is not much of an endorsement. That’s like saying this new and improved tool is almost as good as your old one. How would you compare the Milwaukee surge to the rigid stealth force as far as power delivery? I like the power and volume of my stealth force, but I’m considering buying into the Milwaukee line if I like the surge. Also, can we expect to see some oil drive only impact head to head testing in the future? This also means that with the Pro Tool Innovation Award, you gave Ridgid credit for an innovation that, even if you believe they executed it better, was just them responding to Makita, who actually did the innovating. Seems to stretch the meaning of the word innovation a bit too far.